I have been a happy Mac user for the past three and a half years. I still love the aluminum-silver casing of my PowerBook G4. I love saying, “Shh, it’s sleeping” to friends and pointing out the pulsing light that hearkens the slow, heavy breaths of a slumbering child. I like using key-strokes. I like not having viruses (digital or biological). But, like my failed relationships of years gone by, there is always an inevitable, nagging problem. In this instance, it’s a lack of palatable pre-loaded games. The PC’s got you here, Apple. I have whiled many a happy hour away with my WinBook or Dell Desktop to the simulated sounds of cards flipping and pinball machines clattering. I love that the little smiley face wears shades when you win at Mine Sweeper. Back in the Rattler Race era, I am not ashamed to say that I dominated to the detriment of my eight o’clock class: American Government. What does this Mac-Oh-Ess-Ten, the tiger or the panther or something, offer me? Be still, my palpitating heart. I couldn’t handle that kind of patronization, and have since slid the blue dial away from “computer plays faster” and a little closer to “computer plays stronger.” The computer is still not playing at half-strength and I am losing consistently. I’ve never been very good at chess. Occasionally, in a fit of father-daughter bonding I’ll sit down across the board from my dad. He tries to hide his glee at my obvious ineptitude, but it’s difficult to disguise the giggling. “Are you sure you want your knight there, daughter?” he’ll choke over rising waves of mirth. “Of course,” I posture, my eyes scanning the board for the hole I most certainly cut in my defensive line. Then it’s bam, bam, bam, all my interesting pieces are gone and I’m left with my king and two pawns hobbling around the battlefield, while my dad slowly draws his rooks and bishops into a wolf pack for the Pinscher maneuver. Chess: It’s like bleeding to death, but more boring. I've been putting it off. Resisting the temptation to flock from one blog site to another like a lemming. But recently I've been feeling constrained by the limits of Blogger, and have found myself wandering over to Wordpress, "just to look around." It may happen. It may not. Chain Restaurants That Went Kosher. California relocation for "fresh start" seeks disaster-prone individual for postmove loneliness and employment difficulties followed by crippling "sleep all day" depression episode. Tedious recounting of last night's nonsensical dream seeks potential suitor on first date for obliteration of second-date possibility. First I believe that I must formally concede to the champions of the 4th Annual Pumpkin Carving Competition. 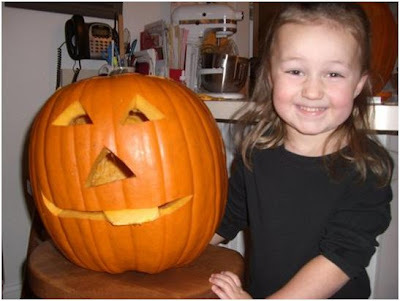 Congratulations Blake and Bekah, your pumpkin was great. 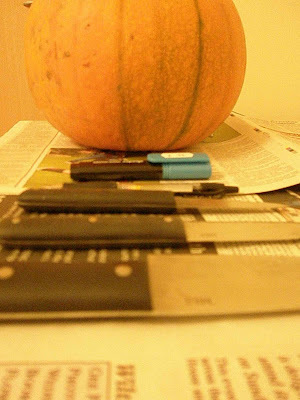 I never would have thought of hacking my pumpkin into cross sections. Actually, there were a lot of really cool pumpkins. I'm feeling a little outclassed and will have to start researching my pumpkin designs for next year soon just to stay in the game. Fortunately this was a busy week, and I was not left with the luxury to nurse my loss for days on end. My life has fallen into a repeating pattern of "on" and "off" weeks. I have two lectures every week, the workshop and the context module. My workshop is structured around writing and receiving criticism for my novel that is still in its very fetal stages. My context module (entitled The Love Story) is a class where we study literature of a specific genre and focus our writing on that genre. So I find that I write a lot of short stories for that class on the theme o' luv. I'm required to turn in work for both classes every other week. That means that nothing is due during week one and in week two EVERYTHING IS DUE. Last week, everything was due. This week I'm on easy street. So all that to say, I was too busy trying to think of a synonym for "handsome" to mourn my near victory too much. I also received some great mail this week, in honor of the Halloween season, which lifted my spirits. You may not know this, and I in fact was not aware until I made the plunge across the pond, that Oreos are not as ubiquitous a food item as many Americans presume. In fact, they are well-nigh impossible to find in Bath, England. So the present of Oreos and Ramen and vampire ears from Laurilee and Sarah was very, very welcome. And the hand-painted pumpkin from Callie Jane was the best ever. We are so, so close! After an astonishing show of solidarity that brought pumpkin-sized tears to my eyes, we and the Scholar Pumpkin have rocketed into SECOND PLACE!! That's right, we are only three votes behind Blake and Bekah Boys and their Mummy Pumpkin as of the early hours of November 7. I really think that we can pull it off - those of you who were waiting until the drama hit a fever pitch can feel free to go ahead and vote now for #13. Hmmm, maybe the Boys don't have this competition all wrapped up. So I know that infectious disease is not generally something you can laugh at, but in early 2003, Newsweek and Time Magazine made it just a little easier. I mean come on. It looks like it was carved by a three-year-old. Well over one hundred votes have been cast in the 4th Annual Pumpkin Carving Competition, which is a pretty amazing feat. Less impressive is the fact that Ken Flower holds 25 of those votes and the Mummy Pumpkin is still holding strong with 21. However all is not lost, and the Scholar Pumpkin is hanging in there with the best of academic spirits. We have eight votes so far, and I know that there are readers out there who have yet to cast their vote. It's easy and fun, too. The only price you'll have to pay is having Ken and Beth's blog pop up in the search bar when you're trying to get to the State of Kentucky home page for the next thirty days. 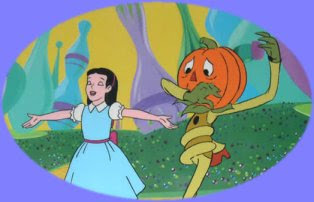 Well, early exit polls show Blake and Bekah Boys in the lead with their "mummy" pumpkin followed closely by Ken Flower and his depiction of some unnamed metropolis. What? You don't know any of these people? Then click here and vote for me! Polls close November 7. 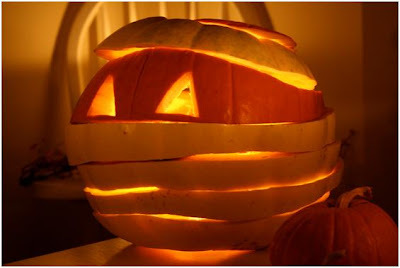 What my pumpkin may lack in artistic acheivement and originality, it makes up for by just being really pleasant. So let's win this together "with the mighty sword of teamwork and the hammer of not bickering! *"
The 4th Annual Pumpkin Carving competition has begun! 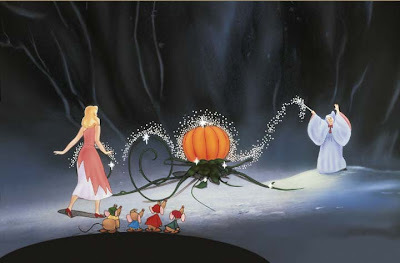 Make sure that you go to the Flower's Blog and vote for the pumpkin* you like best. *Let's not kid ourselves here, we all know that this is just an annual popularity contest for people who never got voted for homecoming court (Ken excepted). So when I say vote for the pumpkin you like best, what I mean is Vote for Me! Because I'm really nice. And I'm all alone in a new country. And the pumpkins are really small here and hard to carve.